Visit the Starbucks Coffee Kobe Meriken Park branch to enjoy the feeling of being on a boat cruise as you sip your coffee, set against the sea and mountains. The Light-Filled Interior Feels Like You’re on a Boat Trip! The seating on the first floor is bathed in light from outside, and you can get a view of the green lawn and the harbor from any seat. We recommend sitting out on the terrace so you can feel the breeze. Sitting at the arched counter on the second floor feels as though you’re on a cruise ship. From the window, which was completed using only glass, the view of the scenery looks like a painting. From the south side, you can see the Kobe Meriken Park Oriental Hotel and the Luminous Kobe 2, a ship that cruises around Kobe Harbor. It feels exactly like what Kobe is supposed to be. The green area in the foreground of the picture is a rooftop garden, an environmentally friendly consideration. On the west side of the second floor, you can see the Kobe Port Tower and the piers from the terrace seats. It’s wonderful to have comfortable sofa seats, isn’t it? Photo provided by: Starbucks Coffee Japan, Ltd.
Pay attention to the wooden louver on the second floor, as well. In order to mark regional connections as important, the cityscape of Seattle, American sister city to Kobe, is drawn on the blinds. Seattle is also where Starbucks was established. The front panels on the bar counter were made using wood from nearby Mt. Rokko. The trays, made from Rokko wood, coffee grounds and plastic, are exclusive to the Starbucks Kobe Meriken Park branch. The whitish-colored, illustrated tiles are made from recycled coffee beans. The tile formations are also made in the previously-mentioned hishibuki style, like the exterior walls of the buildings. Details about the various environmentally-friendly considerations that went into building the cafe, such as the rooftop garden, are written in a file on the first floor counter, so please check it out (English and Japanese are written side-by-side). By the way, have you seen the green cover somewhere before? It’s actually made with recycled materials from the apron worn by Starbucks staff. The last page is for comments, so by all means, write down your thoughts and impressions about the Starbucks. Only six Starbucks locations in Japan, including the Kobe Meriken Park location, carry the special Starbucks ® Nitro Cold Brew. This creamy coffee produces an entirely new taste sensation via coffee extracted with cold water over time, which is then injected with nitrogen gas. It is carefully poured glass by glass, from a tap like a beer server. There is complex motion inside the glass as the coffee moves around, like the folds of a curtain or tiny, overlapping waves. Fragrant, smooth and velvety, we tasted the natural sweetness possessed by coffee beans. It’s a flavor you’ll want to drink again and again. A tall size is 520 yen before tax, and a short size is 480 yen before tax. Get an Exclusive Kobe Mug or Bottle as a Souvenir! Region-exclusive Starbucks items are beloved not just in Japan, but all over the world. Why not pick up a mug or bottle featuring Kobe’s various landmarks as a memory of your trip, or a souvenir to bring home for your friends and family? The stainless steel bottle on the left is 4200 yen (before tax) and the mug on the right is 1800 yen (before tax). Tumblers are also available, and they are sold at almost all Starbucks locations within Hyogo prefecture. Check here for more details. Enjoy the Wonderful Night Scenery! Rather than just visiting during the day, come visit Meriken Park at night, when the entire area is lit up. From inside or outside the Starbucks cafe, you can enjoy the romantic Kobe nightscape. 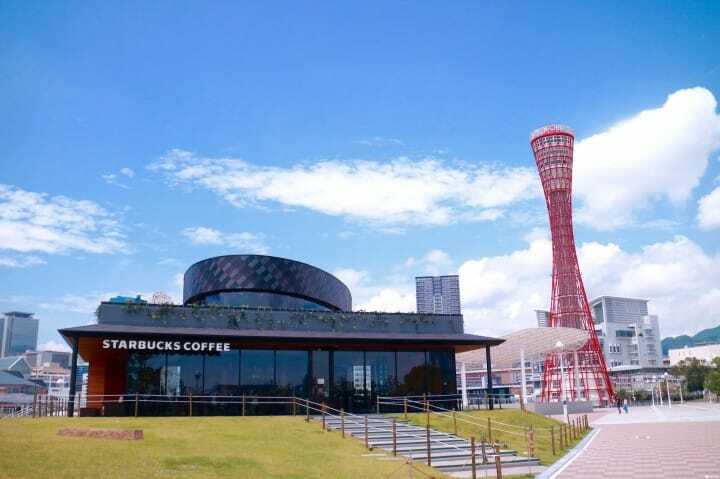 The next time you come to Kobe, visit the Starbucks Coffee Kobe Meriken Park branch so where you can savor the feel of being on a boat cruise, set against a backdrop of the sea and mountains. Article produced in cooperation with Starbucks Coffee Japan, Ltd.
How To Get To Kobe From Osaka - Visit The Port City!